Students are urging the UT System to divest from fossil fuels. Over the next few years, we must begin to take the prospect of fully divesting the UT system’s financial assets from fossil fuels seriously. Endowment funds, land, donorships — all of it. This is not without precedent. Many schools and institutions across the country and world have begun to take such action. These successes were not without conflict between students and administrations, but the result has been a growing tide of divestment across American universities. To achieve this at UT will require mass movement by both students and faculty alike. That would be difficult to do considering that their endowment receives a large royalty from oil and gas revenues. According to the UT System Permanent University Fund, “In 1876, the Texas Constitution set aside land in West Texas to support the University of Texas and Texas A&M systems.” Today, these lands — spanning 2.1 million acres across 19 counties of West Texas — are leased to oil and gas companies. These companies drill wells, and revenue is deposited into the Permanent University Fund and then distributed to all 14 UT System institutions and 10 A&M institutions and agencies. In the last 10 years, more than $2.6 billion have gone to UT’s academic and health institutions to fund dozens of capital projects that support life-changing research that leads to better treatments for deadly diseases and new discoveries that improve our quality of life. These projects include UT Austin’s Dell Medical School and the rebuilding of the Marine Science Institute in Port Aransas, which was heavily damaged by Hurricane Harvey in 2017. Permanent University Fund revenue has also been used to recruit and retain nationally renowned faculty and build much needed classrooms and labs so that UT students receive a top-quality education. Furthermore, that royalty has grown in recent years because of the use of fracking on University Lands. Since 1839, University Lands have been held for the economic benefit of the University of Texas and Texas A&M Systems. The lands generate income through a variety of pursuits, including grazing, wind power and solar power. By far, oil and gas production is the most lucrative endeavor. Fiscal year 2018 revenue to the Permanent University Fund totaled approximately $887 million of which more than 90 percent came from minerals (oil and gas) royalty. The support from the Permanent University Fund and Available University Fund are key to making the high quality education of the UT and A&M Systems some of the most affordable in the country. There have been questions about the need for hydraulic fracturing in relation to University Lands’ oil and gas operations. It is important to recognize that without it, there would be no shale development, which would erase the 10 year oil and gas production boom in Texas and in the U.S. This would significantly limit the income coming from University Lands, and overall oil and gas production in the United States would be cut by more than half. 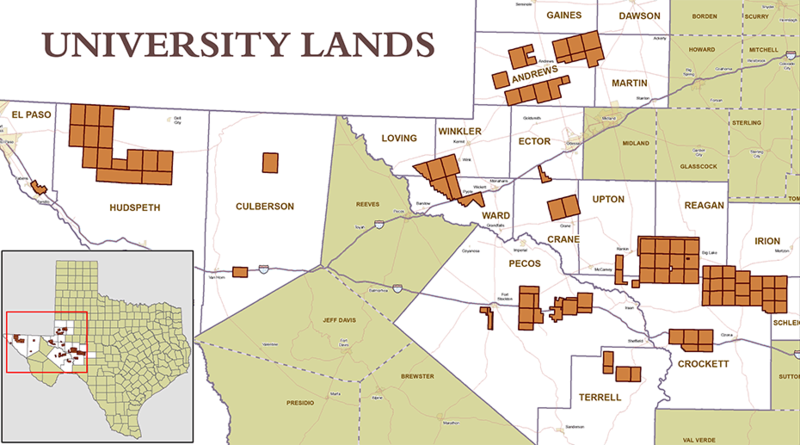 If you are curious to find out where in Texas those 2.1 million acres are located, you can explore the virtual map on the University Lands website. 2.1 million acres in nineteen counties in West Texas.